A CBS News/New York Times poll shows Americans acknowledge the war against terrorism as a higher priority for the country than the economy. But even though terrorism, along with the prospect of war with Iraq, looms high in the public's mind, as the November elections approach it is the worsening economy that voters want to hear about from the candidates. 70% of voters say they want to hear what candidates have to say about the economy, while 17% of voters want to hear the candidates' positions on Iraq. 56% of Americans, more than at any time since 1993, say the national economy is in bad shape. Just 41% approve of the way President Bush is handling the economy - the lowest number since he took office. Most think the President should be paying more attention to the economy than he is, even with the pressures of the war in Afghanistan. And President Bush, members of his administration, and the Republican Party are seen as caring more about the needs of large corporations than about the needs of ordinary Americans. In this midterm election, the President could be a larger factor than other presidents typically have been in the past - both positively and negatively, as most voters say their votes will have something to do with their feelings about the President. Voters are paying attention to what their representatives have to say on the issue of taking military action against Iraq. 87% of voters say that their representative's vote on that issue will be important to their own vote, while only one in ten say it will not be. Overall, however, just 25% said positions on foreign policy would influence their vote, 57% said positions on the economy would be influential, and 11% said both foreign policy and economic positions would be influential. The public is skeptical about how the issue of Iraq is being discussed in the weeks before the election. Over half said they believe that members of the Bush Administration (51%) and members of Congress (57%) are trying to use the topic to their own political advantage in the upcoming election, while 40% said they don't think that's true of the Bush administration and 32% said they don't think it's true of Congress. While the economy may hurt Republicans, views of the President in other areas may help them. More than half of voters cite President Bush as a factor in their vote - more positively than negatively. 32% of voters say theirs will be a vote for Mr. Bush, while 20% say their vote will be against him. 40% say their vote will not be about Mr. Bush - and this is the lowest number saying a sitting president was not an influence in their vote since CBS News and The New York Times began asking the question in 1982. Voters may not consciously base their Congressional vote on which party is in the White House. Still, in this poll slightly more voters say it is better to have different parties control the White House and Congress. Now, 44% agree it is better to have different parties in control of each, while 38% of voters think it is better to have a President from one party and Congress controlled by the same party. Overall voter approval of the job Congress is doing is now slightly negative, but doesn't approach the negative evaluations Congress received prior to the 1994 elections, when party control switched from the Democrats to the Republicans. Now, 41% of voters approve of the job Congress is doing, and 47% disapprove. In October of 1994, 75% disapproved and 19% approved. Just over half say Congress has accomplished less than usual this session, but that's not much different from what voters said two years ago about the nation's legislature. Nevertheless, there is some general desire for change. 70% of voters think that it is time to give new people a chance in Congress, and 15% think that members have done a good enough job to deserve re-election. However, that is not as sweeping a call for change as was voiced in 1994, when 82% of voters said it was time for new people to be elected to Congress. Overall impressions aside, most voters are fairly satisfied with the job their own representative in Congress is doing. 50% think their own representative in Congress deserves re-election, and 38% would rather have someone new representing them. Many Americans think that President Bush, while engaged in the war in Afghanistan and the possible conflict with Iraq, may not have been paying enough attention to important matters at home, such as the ailing economy. There are also concerns over worsening relations with the United States' European allies and America's standing in the international community. Four in ten say the President is spending too much time on foreign policy problems and not enough time on domestic issues. A slight majority, 52%, thinks the President has allocated his time just about right between international crises and problems at home. At least so far, however, Mr. Bush fares much better on this question than his father, former President George H. W. Bush, did. A majority of Americans consistently said the first President Bush spent too much of his time on foreign policy issues, both during and after the Persian Gulf War. Criticism of the current President's attentiveness to and handling of the economy is much stronger. By over two to one, Americans say the President is not paying enough attention to the economy - and the public clearly wants him to pay more attention, even considering the war in Afghanistan. In comparison, in March 1991 at the end of the Persian Gulf War, 55% of Americans said that George W. Bush's father, had paid as much attention to the U.S. economy as he could during the war. President Bush's approval rating on his handling of the economy in this poll is only 41%, the lowest since he took office. While foreign policy may be a stronger area than the economy for the president, the public has some concerns here too - notably in the United States' standing in the international community and its relations with its allies. By 42% to 19%, Americans say the United States is now less, rather than more, respected in the world than it was two years ago. 36% say the level of respect is the same. Half of Democrats say America is less respected in the world today, while Republicans are more evenly divided. And, reflecting the recent tensions between the United States and its European allies on the Iraq issue, 30% say relations with our allies are worse now compared to two years ago. 49% think these relations are about the same, and just 18% say they are better than they were two years ago. Americans over the age of 65 and those with more education are most likely to think the U.S. has deteriorated in the eyes of the world and to view U.S. relations with its allies negatively. President Bush's overall job approval rating is now 63%, slightly lower than in September, right after his U.N. address. Mr. Bush's foreign policy rating remains unchanged from two weeks ago, and his approval rating on the economy, at 41%, is his lowest ever. President Bush and his Administration face a continuing problem: most Americans think both he and his Administration favor the rich and large corporations. Neither the President nor his Administration has made much progress on these issues since Bush took office. By 51% to 42%, Americans say President Bush is more interested in protecting the interests of big corporations than those of ordinary Americans; that has risen since just last summer. 60% say that about members of the Bush Administration. And 55% now say the policies of the Bush Administration favor the rich, unchanged since June of 2001. With a month to go before the Congressional elections, more Americans say things in this country have gotten off on the wrong track than say things are headed in the right direction. Also, more than half think the economy is in bad shape and many say the government in Washington is not focusing enough attention on improving the country's economic condition. 48% of Americans say things in this country have gotten pretty seriously off on the wrong track, while 42% say things are generally going in the right direction. These numbers are virtually unchanged from two weeks ago, but they are different than they were at the start of this year, when 52% said things were headed in the right direction and 35% said things were off on the wrong track. Persisting concerns about the economy and the stock market have now resulted in one of the American public's lowest ratings of the nation's economy since the fall of 1993. Now, 56% say the economy is very or fairly bad condition, while 43% say it is very or fairly good. The percentage viewing the nation's economy as good has dropped eight percentage points in just two weeks. The public's rating of the economy is worse now than it was in October 1994, a month before the first mid-term election under President Clinton, and it is significantly lower than it was in the fall of 1998. When asked to compare the nation's economy to two years ago, seven in ten Americans say today's economy is worse - down twelve percentage points from this past July, when 58% said the economy was worse than two years ago. Americans' assessment of their financial situation is somewhat more positive, but still 33% say their family's financial situation has worsened in the past two years, while 44% say it has stayed the same. Moreover, Americans are split in their opinions about the future job market. While 48% say the are not concerned at all that they or someone in their household might be out of work in the next twelve months, more - 51% - are very or somewhat concerned that might happen. One place where Americans have seen some immediate effects of the lackluster economy, declining stock market, and corporate accounting scandals is in their 401k plans. Of those who participate in an employer-sponsored 401k plan, 74% have seen its value decrease in the past year, 18% say the value has stayed the same, while just 5% say their plan's value has gone up. The public's outlook for the overall economy remains pessimistic. Just 13% think the economy is getting better, while 39% say it is getting worse and nearly half say it is staying the same. That pessimism may be because many don't think the government in Washington is focusing much of its attention on improving the economy. While 62% say the government is paying attention to it (including just 12% who say a lot), nearly four in ten say Washington is paying little or no attention to improving the economy. The public thinks the government is paying even less attention to other domestic issues such as the environment and Social Security. 54% say the government is paying a lot or some attention to the environment, while just 45% say the same about Social Security and Medicare. It appears that the corporate scandals of this past year have tainted Republicans more than the Democrats. The public views the Republican party as more likely to protect large corporations rather than ordinary Americans; and as the party more influenced by big business. Just under six in ten say Republicans are more interested in protecting large corporations, while a third say they are more interested in protecting ordinary Americans. On the other hand, 60% say Democrats are interested in protecting the interests of ordinary Americans, while just 28% say they are more interested in protecting large corporations. When asked directly which political party big business has more influence on, more Americans say the Republicans over the Democrats, by 57% to 22%. 12% say both parties are equally influenced. 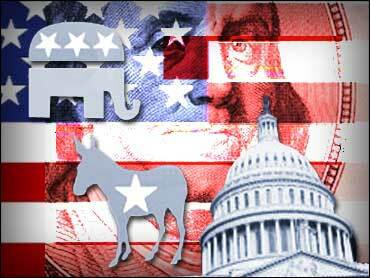 Perceptions of the two parties on other major issues have changed little since the summer. The Republican party is still seen as better able to keep the U.S. military strong and combat terrorism. Democrats, however, have an advantage on domestic issues like health care, the environment and Social Security. Views of the parties are closest on the issue of making sure the country is prosperous, but the Democrats now have a slight edge on the issue, by 41% to 38%. Back in July, Americans viewed both parties as equally likely to ensure the country's prosperity, by 39% to 39%. Overall opinions of the parties haven't changed much since this past July. 53% now view the Republican party favorably, while just as many view the Democratic party favorably. When it comes to the fall vote, Democrats have a slight edge in this poll; currently, 43% of likely voters say they will vote for the Republican candidate in their district, and 46% will vote for the Democrat. Republican and Democratic likely voters strongly indicate they will vote along party lines. Independent likely voters, however, are split; just under half say they will vote for the Republican and a similar number plan to cast their ballot for the Democrat. There is a gender gap; men will support the Republican candidate over the Democrat, while women will support the Democrat. Although less than a third of registered voters are now paying a lot of attention to the election campaigns, that is about the same number paying close attention in October of 1994. This poll was conducted among a nationwide random sample of 668 adults, interviewed by telephone October 3-5, 2002. The error due to sampling for results based on the entire sample could be plus or minus four percentage points. Sampling error for subgroups may be higher.